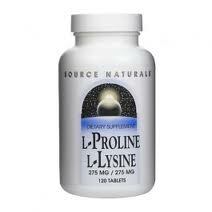 Proline is a non-essential amino acid. It is one of the main components of collagen, the cementing substance that binds and supports the cells. Research seems to indicate the usefulness of proline in the healing of wounds. Its effectiveness is enhanced when combined with vitamin C. Supplementation is advised in cases of persistent soft tissue strains, hyperrnohile joints, and in lax tissues associated with ageing. The therapeutic dose advised is 500 mg to 1,000 mg daily, in combination with vitamin C.